Although founded in 1841, Dallas did not experience significant growth until 1873 when the Texas and Pacific (T&P) Railroad crossed the Houston and Texas Central Railroad (H&TC) near downtown. Securing these railroads led to a prolific building boom that has never fully ended, even during the Great Depression and subsequent world wars. Dallas's ability to sustain growth and development as a banking and commercial center led to the demolition of much of the early built environment, a trend that continues even today. 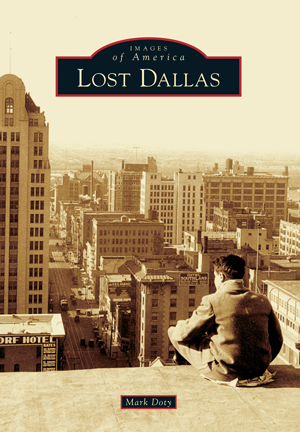 Lost Dallas explores and documents those buildings, neighborhoods, and places that have been lost and even forgotten since the city's modest antebellum beginning. The City of Dallas Historic Preservation Division has been the designated City of Dallas steward for historic preservation since its creation in 1973. The City of Dallas Historic Preservation Division oversees more than 130 individually designated landmarks and historic districts that contain thousands of structures. Along with the City of Dallas municipal archives, the Dallas Historic Preservation Division serves as a repository of historical images and documents. Mark Doty is historic preservation officer for the City of Dallas.